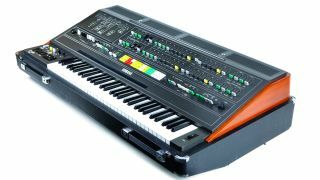 Originally sold for £4950, with only 2000 made, the CS-80 now fetches up to 14 grand! Polyphony was something of a holy grail for the synth makers of the late 70s. Weened on a meagre diet of monosynths for nearly a decade, synthesists longed for a workable way to play polyphonically - that is, with chords. Sure, there were a few string machines, but these were paraphonic, employing octave dividers to produce multiple pitches and then simply running the lot through a single filter and VCA. For many, Sequential Circuits' Prophet-5 was the answer to their polyphonic prayers. Released in 1977, it offered five-voice polyphony and instant recall of user patches. A huge seller, the slick and elegant Prophet-5 received a lot of attention in the press and graced many a stage. Yet Yamaha had been there first. Let loose in 1976, the bulky, garish CS-80 was the antithesis of Sequential's Prophet. A huge Tolex-covered enclosure housed a front panel festooned with brightly-coloured rocker switches and paddle levers that looked as if they'd been pulled from one of the company's home organs. This impression was made stronger by the chrome legs that support its 100kg bulk. A closer look reveals the power lurking beneath, with a trap door concealing Yamaha's answer to patch recall: four nearly-complete miniature copies of the front panel. 22 colourful switches allow access to presets, including an instantly recognisable brass sound. For the serious synthesist, the CS-80 offered two complete and independent signal paths, each consisting of an oscillator routed into a pair of filters (one low-pass, one high-pass) and ADSR envelopes. You could create two completely different patches, one layered on another. Thanks to a staggeringly complete set of performance features, even the presets could be tailored. Polyphonic aftertouch responded in a natural, musical way to the player's pressure on the keys. Oh, and the keys were velocity-sensitive to boot. It's a keyboard that has rarely been bettered and proved to be a major selling point to players desiring more than the limited note on/off of other synths. And then there's the ribbon controller, spanning over half the length of the keyboard, allowing you to, say, touch the felt ribbon near the top and swoop down the whole length of the thing, taking your oscillators' pitch with you. Mind you, the oscillators might just do that entirely on their own - the CS-80 may be the most notoriously cantankerous synthesiser ever made. It went out of tune when transported, or when the temperature changed - and it changed every time you turned the thing on! Though many famous players hauled them out on tour, the wisest CS-80 owner left it safely at home in a temperature-controlled studio. Thankfully, the few virtual incarnations alleviate this most troublesome aspect of the mighty CS. What does it sound like? Think Vangelis' Blade Runner and you've got a pretty good idea. Other users included Eddie Jobson (Alaska), Jean-Michel Jarre, Toto (on Africa and Rosanna), and Ultravox. One of Arturia's earliest emulations, the CS-80V (VST/AU/AAX) has matured into a superb package with plenty of extras to bring more power into play, including a superb modulation matrix that offers 13 sources and a whopping 38 destinations. Chorus, tremolo and delay effects have been added, as has an arpeggiator. A powerhouse performer. The sole commercial competition to Arturia's CS-80V, Memorymoon's ME80 offers all of the features of the original. It was initially built with SynthEdit but has since graduated to full 64-bit native code for both Windows and Mac users. If you happen to own Acoustica's Mixcraft Pro, you already have this beauty in your plugins folder. Reaktor users can get a taste of the CS-80 experience with this recreation, found in the Reaktor User Library. It may not have faux wooden panels or rocker switches, but it does recreate the entire signal path of Yamaha's legendary synth, making it a cinch to create some of the sounds made famous by the real deal.